The candidates in order from left to right. 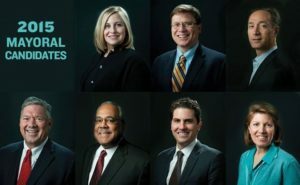 Top Row: Megan Barry, Charles Robert Bone, David Fox. HNI asked the 2015 Nashville mayoral candidates a few questions about their positions on topics related to planning, preservation, and the future of Music City. (Note: We did not receive a response from David Fox by deadline). Question 1: There are many historic places that make Nashville unique. Which are some of your personal favorites and why? Question 2: How important is it to you that Nashville preserve its historic places? Question 3: Do you live in a historic home or historic neighborhood? Question 4: As property values increase, Nashville’s historic commercial properties are extremely vulnerable to being demolished by developers instead of rehabilitated for new uses. Currently, Nashville does not offer a local tax incentive program for preserving historic commercial properties. Additionally, no state tax incentives exist and while federal tax incentives are available, they are very limited. If elected, would you be willing to explore the possibility of adopting a local tax incentive program that would assist developers preserve and rehabilitate historic commercial properties instead of demolishing them? Question 5: The Metro Planning Commission’s Community Plans contain lists of historic properties that are deemed worthy of preservation by the Metro Historical Commission and are guidance documents used by city planners in making decisions regarding new development. Many of these plans are out-of-date, with some being over a decade old, despite the massive increase of both population and development in recent years. If elected, would you be willing to commit to increasing funding for updating the Community Plans so that planners have the most accurate and up-to-date information available? Question 6: Nashville has been a leader in preserving historic residential neighborhoods with some 21 historic neighborhoods zoning overlays protecting thousands of private homes. If elected, would you support expanding this successful program to commercial areas by offering cultural overlays? Question 7: Finally, in your opinion what is the greatest threat to historic preservation in Nashville?